A Natural Plant Nutrient for Organic, Veganic and Hydroponic GrowersCarbotein™ is an economical natural soil conditioner with superior plant growth promoting properties. Carbotein is a mixture of organic vegetable extracts that can be used alone or added to other sources of nitrogen, phosphorus, and potassium. Carbotein nutritive components are present in the easy to use liquid solution, as well as, the high solid content of this natural fertilizer. Carbotein an ideal source of plant nourishment while maintaining operational ease of use. In lieu of its unique organic ingredients, Carbotein can be used in both home and industrial agricultural settings without the hazards of chemical intoxication to individuals or harm to ecological processes and cycles needed for our planet’s sustainability. Carbotein is a natural choice for organic, veganic and hydroponic growers. Carbotein is a collection of specific organic vegetable extracts which have a positive while powerful and positive effect on the growth of plants. When combined with compounds containing nitrogen, phosphorus, and potassium, Carbotein has shown to increase growth yields in crops and lateral growth to offer thicker and more productive plants and turf. Carbotein is applied to the soil as a solution when watering the plants through drip, spray or fertigation systems. The applied solutions containing Carbotein are usefully and metabolically absorbed by plants, which in turn promote superior growth and outstanding botanical health. Plants which can be treated with Carbotein™ include turf grasses, ornamental shrubs, trees, and agricultural crops to include, but not limited to: flowers, petunias, impatients, chrysanthemums, geraniums, poinsettias; spinach, mushrooms, carrots, radishes, beans, wheat, corn, tomatoes, cotton, rice, barley, apple, pear, citrus and other fruit trees, and much more. Carbotein can be mixed with other agricultural chemicals, such as antibacterials, insecticides, ascaricides, nematocides, fungicides, selective herbicides, and the like. Research has shown, that a proper combination of Carbotein with N-P-K nutrient sources causes more rapid growth in plant roots and foliage than do commercial fertilizers alone. Carbotein is an excellent addition to plant fertility programs. 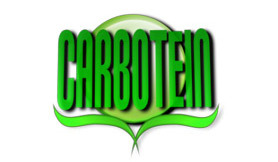 Carbotein offers natural nutritional benefits and it is economically priced.